Gefen has prepared a number of products to be introduced at ISE 2016 in the RAI Amsterdam Convention Center, stand 1-M45. “Gefen innovations have defined commercial AV signal distribution for many years,” said Joe Roberts, president of Core Brands. “Now, as part of Core Brands, we are amplifying the pace with important new introductions for the commercial market.” Building on the new products already launched since joining the Core Brands family, Gefen will premier nine new signal distribution products at ISE, showcasing both what’s new and what’s next. “These new Gefen introductions put us in a stronger position than ever to expand our leadership position in the global commercial A/V signal distribution market,” said Roberts. First among Gefen’s products to appear at ISE is the GEF-UHD-89-HBT2 4K Ultra HD 8x9 Matrix for HDMI. This matrix switch takes advantage of new HDBaseT 2.0 technology to route eight 4K sources to any combination of eight 4K sources to any combination of up to eight remote 4K displays over a single CAT5 cable and one local display with HDMI for local viewing/ monitoring. The HDBaseT 2.0 outputs extend AV and controls up to 100m at 4K Cinema-DCI (4096 x 2160 at 24 or 30 Hz 4:4:4) and 4K Ultra HD (3840 x 2160 at 60Hz, 4:2:0 or 30Hz 4:4:4). Gefen is also showing two new extenders that use the latest HDBaseT 2.0 technology, EXT-UHDA-HBT2 and GTB-UHD-HBT2. Both extend HDMI up to 330 feet (100m) at 4K or 495 feet (150m) at 1080p, using one CAT-5e cable. Both products support resolutions up to 4096 x 2160 at 30 Hz 4:4:4 or 60 Hz 4:2:0, along with 7.1 channels of LPCM and HBR (High Bit Rate) digital audio. The GTB-UHD-HBT2 extends HDMI, RS-232 and 2-way IR. POH (Power Over HDBaseT) technology provides power from the Sender to the Receiver, using the same CAT-5 cable that extends the signal. The EXT-UHDA-HBT2 adds 2-way audio, Ethernet, and POH from Receiver to the Sender. 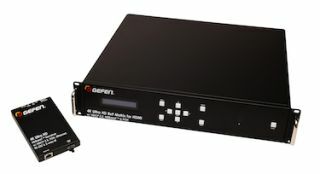 For high performance and extra-long range extension of a computer workstation, Gefen is debuting its EXT-DVIKA-HBT2 HDBaseT 2.0 KVM extender. It extends DVI, USB 2.0, RS-232, and 2-way analog audio up to 495 feet (150 meters) over one CAT-5e cable. Resolutions up 1920 x 1200 (WUXGA) and 1080p are supported. POH (Power Over HDBaseT) provides power from the Receiver to the Sender, using the same CAT-5 cable that extends the signal. And in addition to showing what’s new, the brand will also be previewing what’s next. Gefen showcase the upcoming EXT-UHD600 Series of 600 MHz HDMI Distribution Products. This new product family takes the HDMI 2.0 platform to its highest level by enabling AV distribution at full specification of 4K 60 Hz at 4:4:4 color-space, along with HDR support.